With over 40 years experience, M & G Olympic Products Ltd, specialises in the design, manufacture and installation of custom-built architectural metalwork, including Stairs and Balustrades. As part of a comprehensive package M&G Olympic provide a Project Management service. Our team have a wide experience gained over many years in their chosen field. We have the ability to help identify the best method of completing a project in an efficient and cost effective manner. Our Company’s designers will be pleased to be involved at the earliest stages to offer their expertise and will ensure that all plans comply to all relevant British Standard Regulations where required. We will work with clients or can submit our own design to create an end result which fully satisfies all criteria laid down by the client. With experienced installation teams M&G Olympic ensure a high quality from concept to completion. M & G Olympic Balustrades are manufactured from mild steel, stainless steel, brass or structural glass. 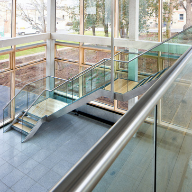 Balustrades can incorporate glass, wire, bar, steel or perforated plate infills and mild-steel, stainless-steel, polyester powder-coated or timber top rails. 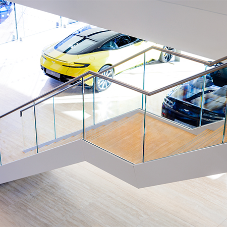 Structural-glass balustrades and vertical or horizontal bar, wire rope or toughened-glass infills maximise visibility and give a light, airy feel to a buildings interior or stairway. Perforated powder-coated aluminium plate, finished to contrast or match the top rail, is also an attractive alternative. Perforated infill panels can be an additional design feature as a variety of perforated shapes can be incorporated using state-of-the-art technology. Balusters and top rails can be either galvanised or powder coated in solid or metallic colours to match the colour scheme of the building, complete the look. Solid timber top rails are also a very popular option. In addition to a wide choice of bespoke barrier rails, sports stadia and crowd-control barriers are also available, including mild-steel galvanised inner-pitch perimeter rails, gates, crush barriers and external handrails, barrier rails and wall-mounted handrails to ramps and steps.